Shiftbeat is an interface that allows the user to intuitively perform music. Intuitive input was created by using gesture recognition through the use of a capacitive sensor. By adjusting the amount of pressure applied to the input sensor, you can adjust parameters, such as time intervals. 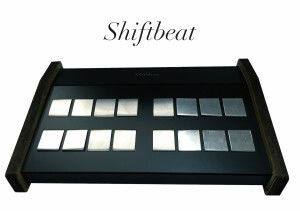 We aimed to produce an artificial rhythm and an efficient way of producing sound that is not possible to perform with existing musical interfaces.